Because we are so close to the Sian Ka'an nature reserve, visitors to Mayan Beach Garden and the Costa Maya have the opportunity to get to see many types of wildlife. Most aren't very accommodating when it comes to taking pictures of them, but there are times that you can get quite lucky. We occasionally hear howlers but I've never seen one at Mayan Beach Garden or in Mahahual. Both of these pictures were taken at Calakmul, a ruin in the Southern Yucatan within a 4 hour drive of Mayan Beach Garden. 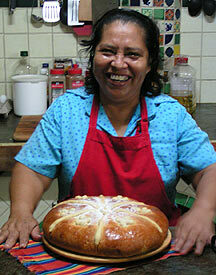 We have also seen them in the ruins of Kohunlich. If you've never heard a howler, it sounds like King Kong is prowling around in the jungle. 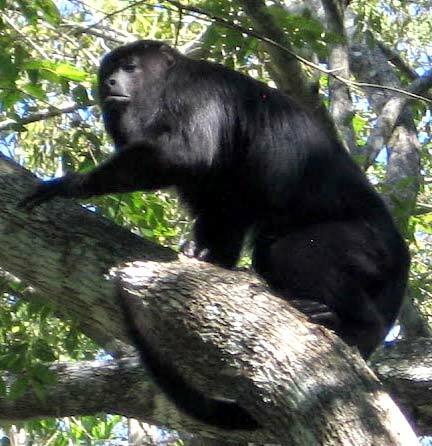 Howlers live quite high in the trees, so you are only going to find them in the forest canopy. They seldomly come down out of the trees living most of their lives in the tree-tops. they are normally asleep during the day time. More common are spider monkeys, which can become pests as they become more comfortable with humans. 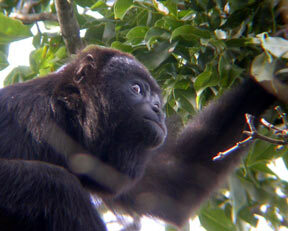 Uyumil Che (nicknamed the "Monkey Farm") is a foundation dedicated to returning tamed spider monkeys into the wild. The Coatimundi is a member of the raccoon family, also known as coati. They are very shy, I was lucky to get the top photo late in the day and surprised it with my flash. 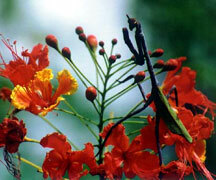 They are omnivorous, feeding on fruits, invertebrates, and other small animals. 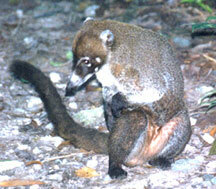 The coati often is seen in large groups of up to 30. When surprised, the entire group will leap into the trees making clicking and explosive "woofs" type of sounds. During the night, coatis sleep in the tree tops in nests of leaves and branches. If you think you hear a lot of rustling in the mangroves, it is probably a family of Coatimundi. 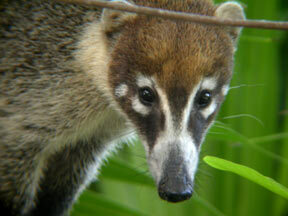 The Mayan word for Coati is Terhun, so you may also hear this term used for the same animal. This walking stick was over 8 inches long. 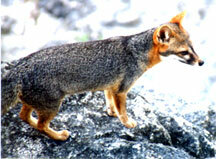 El Zorro or the gray fox is a very common thing to see. Although very common, it's hard to photograph. I was lucky to photograph this one at Tikal. Around Mayan Beach Garden, we seen them running along or across the road but I'm always too slow to catch a good picture. They are extremely agile and fast. Iguanas in the Yucatan can get quite big and can be easy to approach. Each one seems to have its own character. The locals love to eat them (they taste like chicken, of course). They are a pest because they like to eat vegetables in the garden. 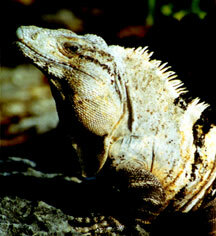 You'll see many Mayan gardens protected from the iguanas with chicken wire and netting. Crocodiles don't like the beach, but can occasionally be seen in the lagoon. This one was photographed on a river along the border of Mexico and Guatemala (not too far away) and was about 16 feet long. This Box Turtle was found crossing the "Jungle" road. This little fellow was about 8 inches long. Miscellaneous land turtles (like the picture at the left). When you are driving along the roads in the area, please watch for turtles crossing the road. They will look like a rock in the road. Don't be surprised to find a gecko in your room. This little fellow was crawling along the glass block in the bathroom. They sound like a cricket or little bird chirping in your room and are doing their job clearing the room of unwanted bugs.